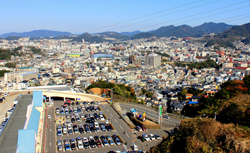 Although many come to see the Atomic Bomb Museum, the city has much more to offer, including churches, shrines and temples dotting the hillsides, and a thriving city center near the dock. Excellent tour guide on this excursion - the peace park was a delight. Visited Shimabara Castle and the nearby Samurai Village.